In 2017, the adoption and use of open resources at UBC continued to increase. Since 2011, more than 47,000 UBC students have enrolled in courses in which instructors used open or freely accessible resources instead of traditional textbooks. At least $4.7 to $6.7 million dollars have been saved by UBC students in these courses and these figures are increasing each year. In academic year 2017, 14,831 students were impacted by courses using only open resources, representing a 20 percent increase over the numbers of students impacted in academic year 2016. Please note: Open UBC Snapshots attempt to quantify and explore emerging trends in open educational practices at UBC and last year’s report can be viewed here. Statistics and information in the Open UBC Snapshots are compiled by the Centre for Teaching, Learning and Technology (CTLT) with support and input from the broader UBC community. Numbers used in this report represent a snapshot of verified activities at UBC; however, a large portion of open educational practices happen independently and may not be accounted for in this snapshot. Please help us make this series more complete. If you are using open resources in your own teaching and learning or are aware of any open practices or adoptions on campus, please let us know! What Do We Mean By Open Resources? Open Educational Resources (OER): OER are defined as “teaching, learning, and research resources that are free of cost and access barriers, and which also carry legal permission for open use. Generally, this permission is granted by use of an open license (for example, a Creative Commons license) which allows anyone to freely use, adapt and share the resource—anytime, anywhere” (SPARC, n.d). Open access or freely available resources are those teaching, learning, and research materials that are free of cost and access barriers but do not include a permissive copyright license that would allow for the resources to be adapted, copied, or shared without direct permission of the copyright holder. At UBC such resources often take the form of custom course notes, self-created resources or textbooks that the instructor has created and posted openly online but who has not openly indicated any reuse permissions through the use of open licenses, such as a Creative Commons licenses). For the purposes of this report, resources that were not openly accessible were not included. Please see Appendix B for a sample of open resources used by courses at UBC. According to the 2017 AMS Student Experience Survey, UBC-V undergraduate students spent an average of $814 on textbooks over the previous year, which is approximately 30 percent more than what they reported spending in 2016 (pg. 54). Additionally, 93 percent of students reported buying a textbook and never using it, while 43 percent of undergraduates reported they often or frequently go without textbooks or resources due to cost (pg. 57). While textbook spending is increasing, the number of students enrolled in courses using open or freely available resources is increasing as well. At UBC, the estimated number of students impacted by open textbook displacements in academic year 2017 is 14,831, 21 percent more than the number of students impacted in academic year 2016 (fig. 1). Since 2011, at least 155 UBC courses have been identified as having used open textbooks, OERs, or freely accessible resources instead of traditional textbooks. And if we look across those past six years, 47,423 UBC students were enrolled in those courses using open resources. The estimated cost savings for students has also increased over the past few years. 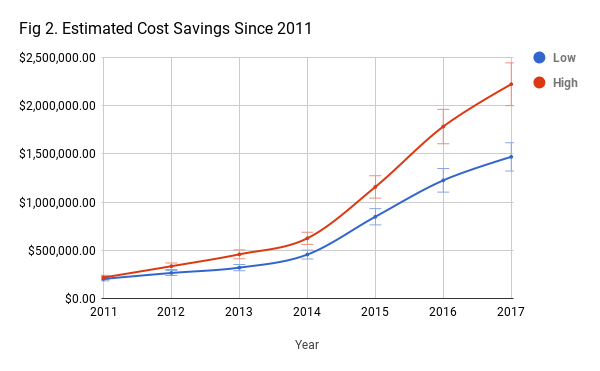 The replacement of traditional textbooks with open resources has potentially saved UBC students between $4.7 to $6.7 million since 2011 (fig. 2). This range reflects alternative buying options available for students including new, used and rental textbooks and is based on the approach used by the BC Open Textbook project to estimate savings. The high end of the range is based on new textbook prices and course enrolments while low end value is calculated based on an average cost of $100 per student per textbook. 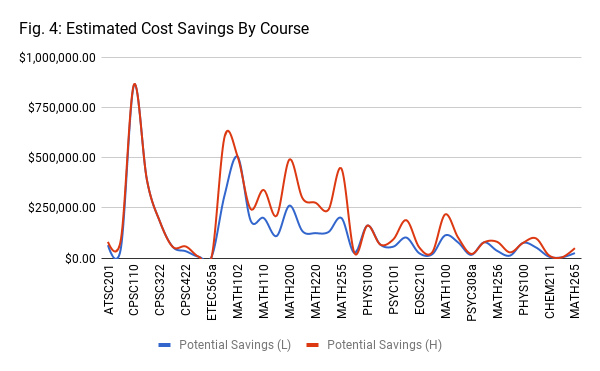 Additionally, for courses that reported never using a traditional textbook, a $100 per student cost savings has been used to calculate potential financial impacts. At UBC, student savings in academic year 2017 are estimated at $1.4 to $2.2 million, while student savings in academic year 2016 are estimated at $1.2 to $1.7 million (Fig. 2). This represents an approximate 20 to 25 percent increase in potential cost savings in the current academic year. 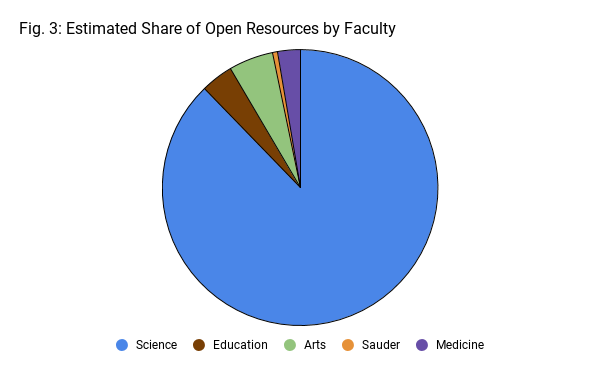 Instructors in the UBC Math and Computer Science departments have the highest number of courses using open resources, and, as a result, the largest percentage of courses that are using open resources is within the Faculty of Science (fig. 3 & fig. 4). Both UBC-Vancouver and UBC-Okanagan campuses have adopted open strategies in the context of innovation funding. The Teaching and Learning Enhancement Fund (TLEF) was created in 1991 to enrich student learning by supporting innovative and effective educational enhancements. It is financed through a portion of the student tuition paid to UBC Vancouver and is a driver of innovation in both pedagogies and educational resource and tool creation and use at UBC-V. For the 2017/2018 funding round, a priority focus on development or integration of OER was added to the criteria for new proposals. Furthermore, the 2017/2018 eligibility requirements specifically stated that funded projects would be encouraged to openly license their developed materials under an appropriate Creative Commons license to allow for broad sharing within and beyond UBC. The 2017/2018 funding cycle was the first time that the TLEF application process had an explicit focus on open and 64 proposals were funded. Of those, approximately 25 percent of the projects had an explicit open strategy. These open projects, in aggregate, received $504,000 in funding, or slightly more than 21 percent of the total TLEF funds that year. Open ChemE: Increasing authentic student learning through open educational resources: This project aims to increase authentic student learning through the curation, development, and provisioning of openly available multi-media resources. Additionally, students will be asked to edit and build upon these educational resources as part of their coursework, creating a dynamic, and ever-evolving learning resource. Augmented Forests: Supplementing Forestry Field Instruction with Virtual Field Instruction and Dynamic Adaptive Quizzing: This project seek to improve student plant identification skills and knowledge by supplementing field instruction with engaging, web-based, open resources to support student self-study. It will produce professional videos showing these plants and their characteristics, and will develop a web-based, dynamic quizzing system for students to practice and test their knowledge. Your Professional Digital Identity: Case Studies from the Digital Tattoo Project: This UBC Library project pilot will develop a collection of open case studies to support graduates in Education, Law and Health Sciences in making informed decisions about their digital identities and data ownership. SoilWeb200: Open Resource for Authentic Student Learning: This objective of the project is to enhance use of the open resource, SoilWeb200 by embedding open pedagogies (e.g., student-generated newsfeeds, Wikipedia-based activities) that allow authentic knowledge creation and encourage students to connect course content with real-world applications. Proposals funded in the 2017/2018 cycle are still in development. The priority focus on open educational resources and encouragement to use open licenses was included for the 2018/2019 funding round. Funded projects will be announced in February 2018. In addition to the TLEF, institutional support for open practices continues to increase. In 2017 the UBC Library, the UBC Bookstore, and the Centre for Teaching, Learning & Technology supported the Alma Mater Society (AMS) in their #TextbookBroke campaign to raise awareness about the impact of textbook fees on student learning. UBC has also held a number of events and sessions to promote and increase capacity for open educational practice, such as full day series of workshops to support open practices, multiple teaching and learning based Wikipedia edit-a-thons, and joint institutional events for international Open Access and Open Education weeks. The Open UBC website, a curated collection of resources for UBC faculty and students to learn about open education practices, has continued to grow with new resources, such as an accessibility toolkit for creating OER and had more than 13,000 page views in 2017. Open practices are enabling faculty, staff and students at UBC and beyond to reduce barriers and improve teaching and learning by opening their classrooms, incorporating new resources and perspectives, broadly sharing their data, and contributing to public knowledge. The previous 2016 Snapshot identified 59 courses using primarily open resources; this year’s update identified an additional 96 more. In addition to textbooks, the UBC community incorporated new open platforms, such as Jupyter Notebooks, open multimedia resources, such as MOOC based videos, and open pedagogies such as Wikipedia based assignments into their teaching and learning. The selection of open resources, tools, and pedagogies at UBC is still largely increasing through the hard work and individual efforts of UBC faculty and students. In order for to help open practices support better teaching and learning practices at UBC, those efforts need to be continue to be recognized, coordinated, celebrated, and supported at the departmental, Faculty, and institutional levels. The use of fee-based homework systems, “inclusive access” course material platforms, and required proprietary software packages have the potential to add even more fees and barriers for student access to ancillary resources required for assessment, and alternatives, including open options, should be explored and developed. If you are interested in finding or sharing more information about open educational resources or open practices at UBC, please see the resources section at open.ubc.ca or contact us. UBC Open Dialogues are a series of videos and articles where UBC faculty, students, and staff discuss and reflect upon their open practices and approaches. Please help us make this list more complete: if you are using an open resource at UBC, please let us know!